SKYLOTEC has extended its range of rescue equipment with the “Conrest” advanced rescue stretcher. The new advanced rescue stretcher is particularly well suited to transporting injured persons as quickly as possible in confined spaces. The stretcher is shorter than comparable solutions, but protects and secures the most important areas of the body. A pelvic strap ensures increased stability of the patient. Anyone performing maintenance in ducts and shafts or in the hub of a wind turbine must secure themselves reliably against falls from a height. In addition, freedom of movement in such areas is generally restricted. This increases the risk for the employees, especially if an accident happens in a confined area. If injured persons are unable to get themselves to safety after a fall, immediate rescue is essential. For precisely such scenarios, SKYLOTEC has developed a new advanced rescue stretcher called “Conrest”. It is lighter and shorter than the usual solutions on the market and more practical than a spineboard, which often cannot be used in confined spaces due to its size. “Conrest” makes it possible to prepare an accident victim for transport in a very short time so that first aid can be administered directly at the accident site. 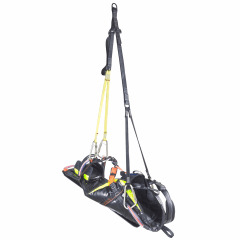 It secures the most important areas of the body and offers rescuers a wide range of options when it comes to pulling the injured person out of the danger area. An additional strap secures the injured person’s pelvis, providing important stability in the event of possible fractures. In addition, the advanced rescue stretcher is equipped with arm loops and a head attachment to stabilise the spine, head and arms. “Conrest” also features a sturdy skid plate, which enables it to be pulled over edges without jamming. The advanced rescue stretcher also features a number of handles to enable rescuers to move the injured person out of the danger area as quickly as possible. Alternatively, the stretcher’s loops can be attached to a set of straps that are in turn connected to an attachment point. By connecting this to a carabiner attached to the rope wind of a mobile system, such as a tripod or Davit arm, the injured person can also be pulled upwards (e.g. out of a sewer shaft) on the advanced rescue stretcher. “Conrest” has a maximum payload of 150 kilograms. A foot cover, which can also be used to secure the patient's feet, is included as standard equipment. The stretcher, foot cover and lanyards (including carabiners) are all stowed in a single bag, which can either be stored at the site or easily transported, thus ensuring that the advanced rescue stretcher can be used immediately in an emergency.